Mary Anne here. Black beans were on sale at my local grocer and so I decided to take these beauties out for a spin. Most – if not all – of the bean soups I’ve sampled are pretty predictable in a sort of monosyllabic way. But as I considered my seasonal culinary options, visions of Candied Sweet Potatoes started dancing in my head. And while I was prepping my beans and potatoes for their photo op, a friend popped by and declared the soup, “A taste of autumn in a bowl!” Thanks, Frannie. As she dipped her spoon for a second sample, it occurred to me this soup would make a fabulous first course for Thanksgiving dinner. As for the substance of the soup, it’s ultra thick and creamy without the guilt. 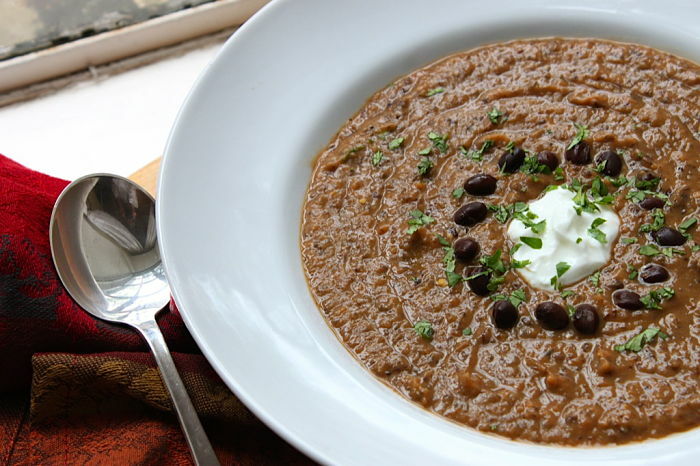 The sweet potatoes provide the body of this potage while the black beans, onions, and tomatoes balance the resonating sweetness. My rendition is healthful – chock full of vitamins, protein, and beta-carotene – and as far as I’m concerned, adding ham or other smoked meat would only gild this lovely lily. Side note: When we created Feast on the Cheap, we outlined a section dubbed Super Sundays. As both Mariel and I have taken on new jobs, we find that our cooking and creating is happening primarily on the weekends as opposed to weeknight trials and (ahem) occasional errors. By cooking several dishes on a relaxed Sunday, I stock my freezer with enough nibbles to last the week. When I come home from work, dinner is once again a pleasure since I know I already made it! Worth considering, if you find you’re too short on time but long for an appealing and satisfying meal at the end of the day…without breaking the bank on take-out! Notes: We eat sweet potatoes regularly and Michael has mastered the art of cooking them in the microwave. While normally I’m a purist and prefer to roast my vegetables in the oven, his method is a major time-saver and the result is absolutely the same as baking in a hot oven for an hour. If you prefer tradition, bake the cut potatoes, loosely covered in foil, at 350 degrees until very tender. Prepare the soup with vegetable stock for a vegetarian version. You will need a food processor or blender to puree the soup. Ingredients: 2 large sweet potatoes (about 2 lbs. ), scrubbed and cut in half – $2.63 4 Tablespoons sweet butter, melted – stock 1 Teaspoon ground cinnamon – stock ½ Teaspoon ground ginger – stock ½ teaspoon ground nutmeg – stock 2 Tablespoons brown sugar – stock 3 – 15 ½ oz. cans black beans, rinsed thoroughly and drained – $2.67 1-14 ½ oz. can diced tomatoes, drained – $0.99 1 large Vidalia onion (about ¾ lb. 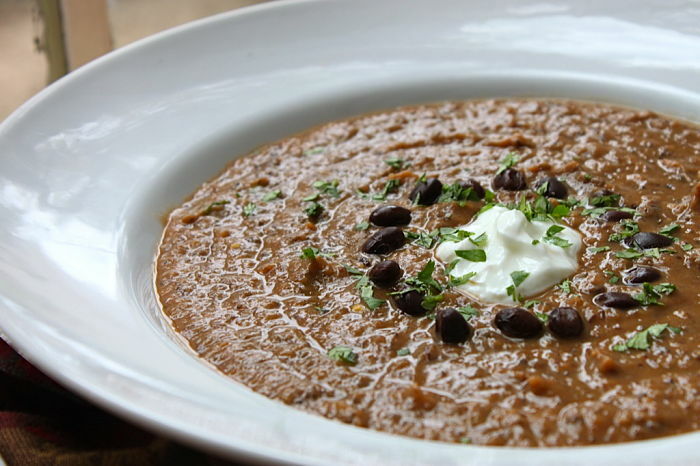 ), chopped – $1.18 2 Tablespoons olive oil – stock 4 cloves garlic, minced – stock ½ cup dry red cooking wine – stock 4 cups chicken or vegetable stock (or more if thinner consistency desired) – $2.50 salt and freshly ground pepper, to taste – stock Garnish (optional): sour cream, creme fraiche, or Greek yogurt black beans, rinsed and drained fresh cilantro, chopped chopped walnuts Grand Total Assuming a Well-Stocked Pantry: $9.97 Total Per Serving: $1.66 Directions: 1. Prepare the sweet potatoes. Using a vegetable brush, scrub the skins. Cut the potatoes in half and place on a microwave safe plate/platter. Cover the potatoes with a dampened paper towel. 2. Place the prepared potatoes in the microwave and cook on the highest (10) power setting for 7 minutes. Test for doneness by pricking the potatoes with a fork. Continue cooking on high in increments of 1 to 2 minutes until the flesh is soft all the way through. (Mine took 11 minutes total time.) 3. Meanwhile, prepare the candied glaze. Melt the butter in a small saucepan over low flame. Add the spices and brown sugar, stirring well to combine. Bring to a low simmer and then remove from the flame. 4. Score the cooked sweet potatoes with the tines of the fork and pour the candied glaze over each half. Allow to cool slightly for easier handling. 5. Scrape the sweet potato pulp into a large bowl. Discard the skins or freeze and use later in a vegetable stock. 6. Add the drained tomatoes and rinsed black beans to the sweet potatoes. Set aside. 7. In a large stockpot, heat the olive oil over medium flame. Add the onions and sauté, stirring frequently, until golden, about 10 minutes. Add the garlic and saute’ an additional 5 minutes. 8. Deglaze the pan by adding the red wine to the onions. Stirring frequently, simmer until the liquid is reduced by about half. Transfer the onions/wine mixture to the black beans, tomatoes, and sweet potatoes. Do not wash the soup pot. 9. Ladle half of the black bean mixture into the bowl of a food processor, fitted with the steel blade. Puree until smooth. Transfer to the soup pot. Puree the remaining vegetable mix and transfer to the pot. 10. Over medium–low flame, gradually stir in the chicken or vegetable stock. Bring to a low simmer and cook, stirring frequently, until heated through. Add more stock if you prefer a thinner consistency. Correct the seasonings. 11. Serve hot. Garnish with sour cream, black beans, cilantro, or walnuts if desired. I love using Sundays to make multiple meals- esp now that it’s crock pot season, and it’s not so humid! This looks amazing! That soup looks and sounds great! I like preparing many meals on Sundays too, although not as often as I should…I even have some TV dinner style plate with the dividers and lids that I use to freeze up for dinners or lunches for one or to take to work. I have never thought of pairing black beans and sweet potatoes, what a great idea! Hi Rhonda. I HAVE to find some of those containers with dividers. Where did you find yours? Perfect for complete meals plus I love the lunch idea! This looks so delicious! This soup is something that both my husband and I will LOVE! What a nice bowl of comfort – hearty and healthy, and I agree, perfect for Thanksgiving! YUM. It looks so thick and hearty. Oh my goodness…I absolutely love this!!! Thank you! It is sooo good – I ate ALL of the leftovers this week! I recall talking to you on the phone the day you made this wonderful sounding soup! You said the kitchen was full of aromas reminiscent of autumn. The pictures are great and I cannot wait to test this recipe for myself – yum!